Lara Croft’s bold return to gaming is rapidly approaching, and Eidos has finally decided to unveil information on the teased multiplayer component of Tomb Raider. A new installment to The Final Hours documentary series, hosted by Zachary Levi, reveals exactly how players will be traversing, shooting, and hunting their rivals across the island. Multiplayer evolved for Tomb Raider as the development team began to flesh out the rich world and warring factions of the island. The team places emphasis on the multiplayer success of Tomb Raider: Guardians of Light, as a core belief that they would be able to successfully bring a multiplayer component to the game without fear of sacrificing the immersive single-player narrative. Players are able to set traps for enemies which include snares, explosive ammo boxes, and even lightning rods. Traversing the landscape will surely prove to be one of the most interesting components of the game. Adding the difficulty of managing vertical gameplay will be a familiar feeling for those comfortable with the Uncharted series, but it seems that Tomb Raider may very well surpass the free climbing abilities of Nathan Drake. Oh, curious about the weaponry? 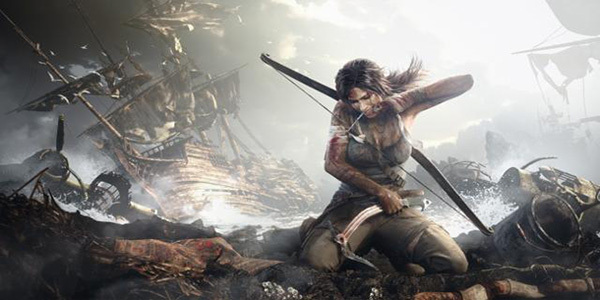 Well, if you were hoping to have access to Lara’s now infamous bow, you’re in luck because you’ll be silently eliminating your friends online in just a few short months. For now, enjoy the new trailer and be sure to let us know what you think of the new multiplayer in Tomb Raider.